Puerto del Sol is Albuquerque's only golf course featuring a lighted driving range. Lighted Driving Range open 7 nights a week, Memorial Day until Labor Day. Rated an outstanding 9-hole course by the National Golf Foundation, Puerto del Sol includes ample-sized greens and wide tree-lined fairways. Most holes are straight, and the terrain is flat with the exception of two rolling fairways. The course is easy to walk, making Puerto del Sol popular with beginner golfers and seniors. This regular 9-hole course measures 3,030 yards from the championship tees, 2,830 yards from the regulation tees, and 2,525 yards from the forward tee. The 9-hole par is 35 for both men and women. 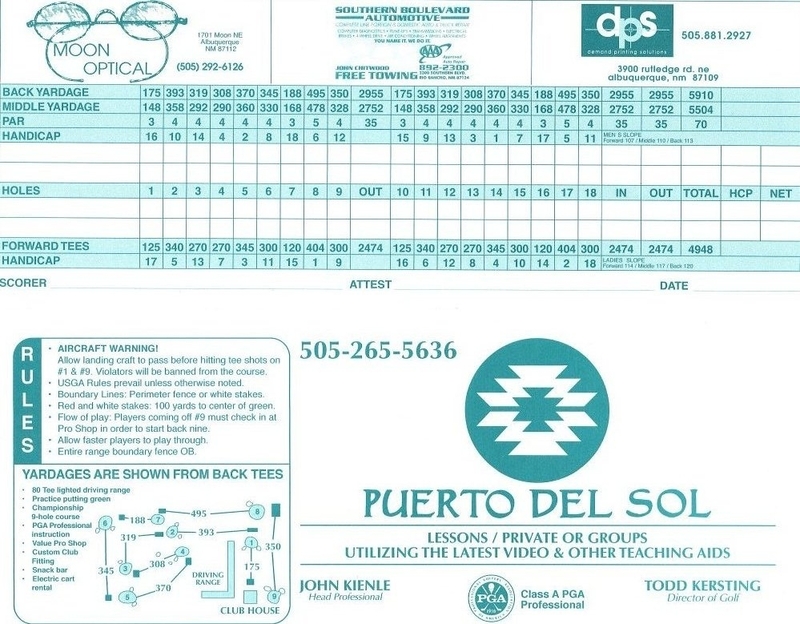 Golf instruction at Puerto del Sol is available from a highly recognized PGA Instructor in Todd Kersting, director of Golf at Puerto. Kersting is available by telephone, or through e-mail for appointments for lessons, or on your next visit to Puerto del Sol. For your golfing needs, you can just ask for Todd at the Pro Shop counter. Lessons are available for players beginner to advanced using some of today's keenest eyes & advanced technology. Give us a call or just come on by. View more information about lessons with Coach Todd Kersting. Call for more information: (505) 265-5636. Junior lessons for kids from ages 5 to 14 years old are available upon request, as well as summer camps. Cost for private lessons for juniors is $35 per lesson, or $150 for a series of 5 private lessons. 2017 Summer Camps start on June 6. Tuesdays and Thursdays in June and July from 8:30 a.m. to 11:30 a.m. each day. $100 per week. (Includes instruction, materials, practice balls, equipment if needed and lunch). Returning students pay discounted rate of $85. Discounts also available for siblings. Sign up weekly or call ahead to reserve your spot. 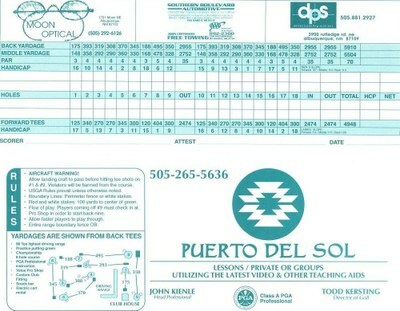 Year-round instruction for golfers of all ages occurs at Puerto del Sol. There are hundreds of golfing stories that have begun at Puerto with Todd Kersting. Take time to call or check in at the Pro Shop to begin your golfing journey. * Afternoon rates are effective 4 1/2 hours before the official sundown.